Scrub the potatoes (gently! the skins are delicate) and then make sure they’re roughly similar size. If you have any ones that are a little bit larger, cut them in half or quarters. 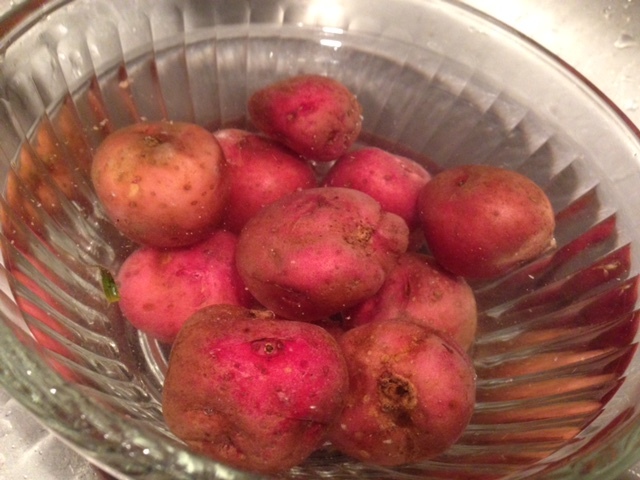 Place the potatoes in a large saucepan and cover (or come close to covering) with water, adding a teaspoon or two of salt. Turn the stove on high and let it come to a boil, then boil until the potatoes are knife tender. That’s a thing. The biggest tip for this recipe is that you don’t want to overcook the potatoes when boiling—it’s better for them to be slightly underdone before going into the frying skillet, not mushy. Then remove from heat and drain the water completely (water is NOT your friend in the next step). 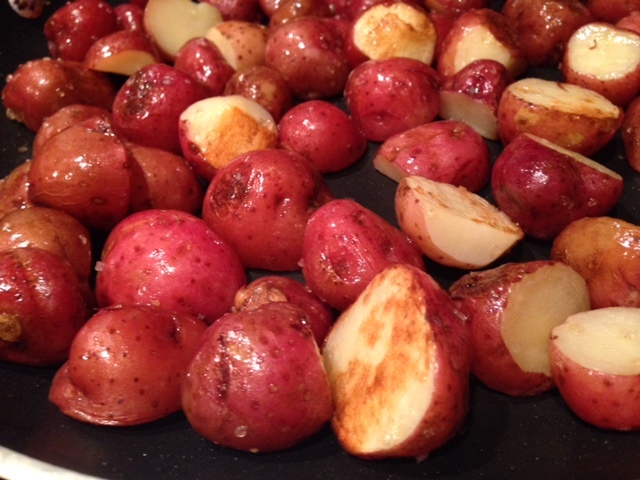 When the potatoes are close to done, heat a few tablespoons of butter in a large skillet on medium-high. The amount of everything is going to depend on the amount of potatoes you’re using, and there’s not a wrong amount. For a batch this size we used 3 tablespoons of butter. 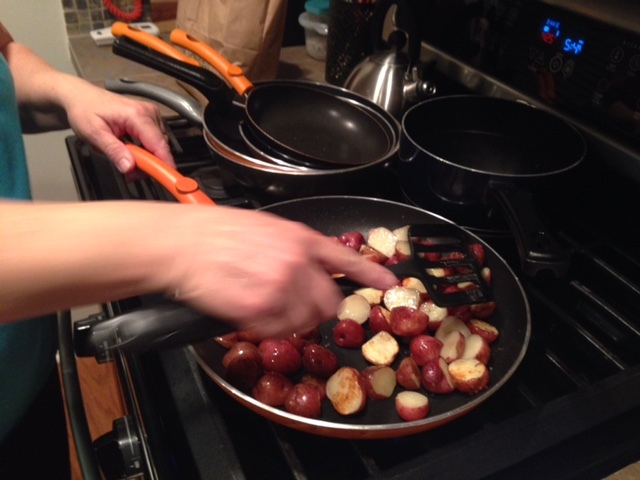 Once you’ve completely drained the potatoes, add them to the skillet. The butter should be hot enough that it sizzles, but not popping and burning you. Use a spatula to totally coat the potatoes with the butter, and let it sit for a minute or two before stirring. Stir occasionally, you don’t want it to burn but you do want it to get a good crisp on it. Add salt to taste as well. Serve piping hot. That’s it. Like I said, it’s barely a recipe, but it IS amazingly delicious. The amount of everything in this recipe is going to depend on the amount of potatoes you’re using, and there’s not a wrong amount. It’s incredibly flexible. For a batch this size (about a pan’s worth) we used 3 tablespoons of butter. Place the potatoes in a large saucepan and cover (or come close to covering) with water, adding a teaspoon or two of salt. Turn the stove on high and let it come to a boil, then boil until the potatoes are “knife tender”. That’s a thing. Basically, it’s still a little firmer than fork tender. Then remove from heat and drain the water completely (because water and hot butter don’t mix). 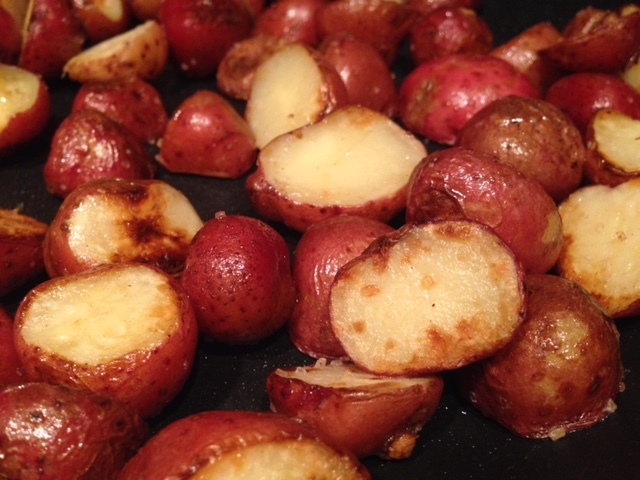 When the potatoes are close to done, heat a few tablespoons of butter in a large skillet on medium-high. 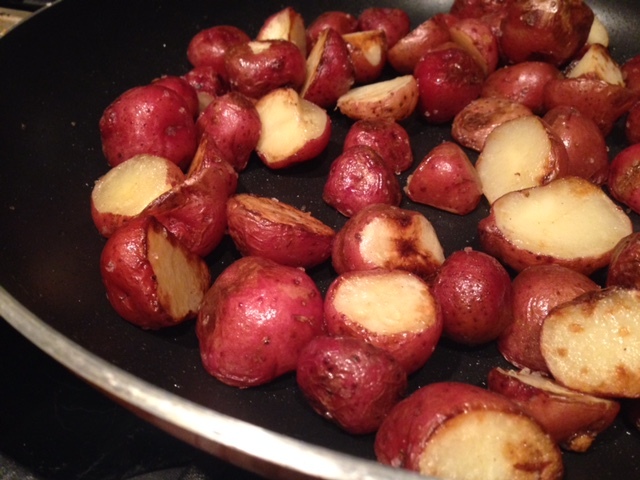 Once you’ve completely drained the potatoes, add them to the skillet. The butter should be hot enough that it sizzles, but not popping and burning you. You’ll cook them for about 10 minutes, but obviously it will depend on how big your potatoes you have and how many—if your pan is too crowded, it will be hard for them to really get a good crisp, so consider a bigger pan or doing two batches if necessary.